While you may have found the perfect personalized diaper bags for twins, what do you do if it’s just not big enough? Well, you read our diaper bag buying guide to find one that is! We researched some of the best-selling, most raved about diaper bags to find out which ones are a great match for families with twins. Before we get started, let’s take a look at some key features you should consider when shopping. Changing Pad: When your little ones desperately need a diaper change, it’s not always possible to find a changing table. That’s why changing pads are so convenient. Some of these products include one or even have one built right in. Size: You need a big bag for twins which is why we included the dimensions of each product. Pay special attention to the width or each one. The range quite a bit, running anywhere from 4 to 8 ½-inches! 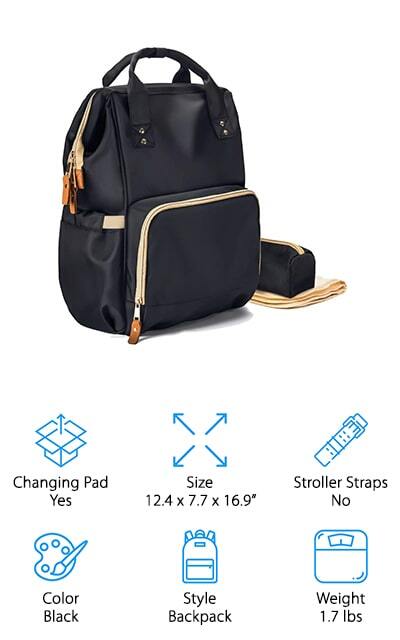 Stroller Straps: Being able to attach a diaper bag to a stroller is the best way to keep everything in easy access while pushing your little ones. It’s hands-free and extremely convenient. Some bags have straps built right in. Color: Most of the bags we chose for our list are somewhat neutral to appeal to moms and dad, mostly gray, white, and black. That said, we did find some great patterns and a few bright colors, too. Style: Generally, these products are either backpacks, totes, or messenger style bags. But get this, we also found quite a few that are versatile and can be carried in a few different ways so it’s pretty easy to find a good match. Weight: Let’s face it, you’re going to be filling these bags to the brim with everything you need for your twins and it’s probably going to get pretty heavy. You don’t want the bag itself to weight any more than it needs to. Now that you know what to look for, let’s move along into our diaper bags for twins review. Here’s the deal. We put our top and budget picks right at the top of the list. If you’re in a hurry, this is the best way to get an idea of the range that’s available. Stick around if you can, though. All of these products are worth a closer look. Alright, are you ready to get started? Let’s get to it. 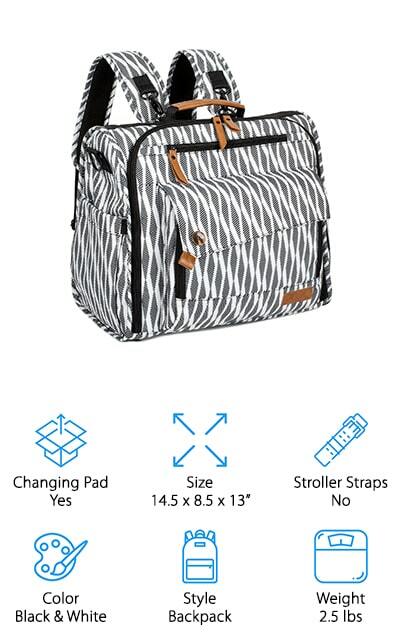 Our top pick for baby diaper bags for twins is this design from Bag Nation. 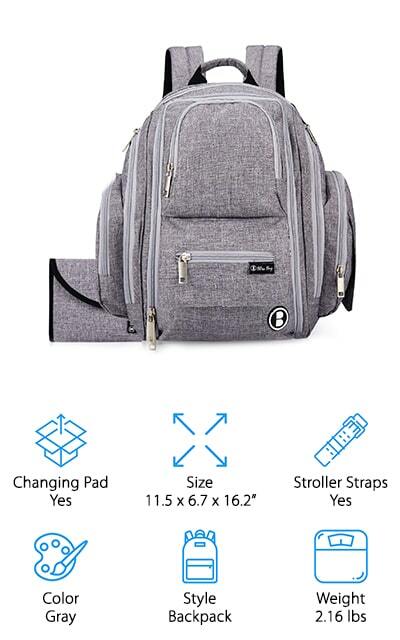 This is a backpack style bag that can also be strapped to your stroller. One reason it’s such a good choice for twins is that there’s so much room for organizing. With 14 different pockets, this bag has enough places to keep everything you need for your babies neat and close at hand. The water resistant twill polyester material has non-fraying stitching along with strong zippers that will last so long, it comes with a lifetime warranty. The shoulder straps are padded and ergonomically designed for comfort. 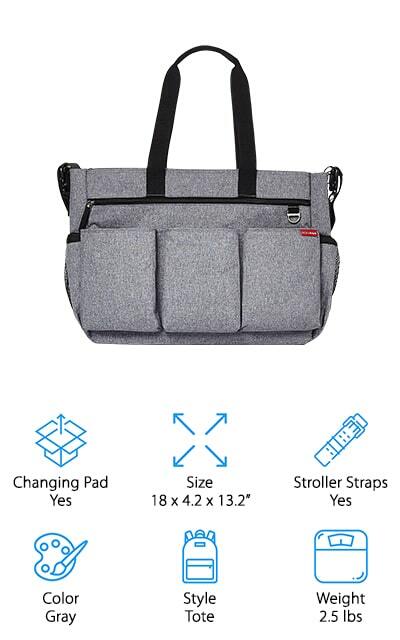 This bag comes with a large changing pad as well as a sundry bag and the unisex design makes it a great choice for moms and dads. The Wallaroo Diaper Backpack is our budget pick for large diaper bags for twins. This backpack design has a ton of internal and external pockets that fit just about anything you need to take with you. Some are insulated, some are not. And get this, there’s even room for your stuff, like a large pocket inside that can fit a 15-inch laptop and an easy-access space for your cell phone. The polyester material is stitched together with high tensile strength nylon that’s quilted for a bit of extra style. It’s also super easy to clean. This bag is tear and water resistant so it can stand up to a lot of wear, which is good because it’s likely it will get a lot of use with twins! 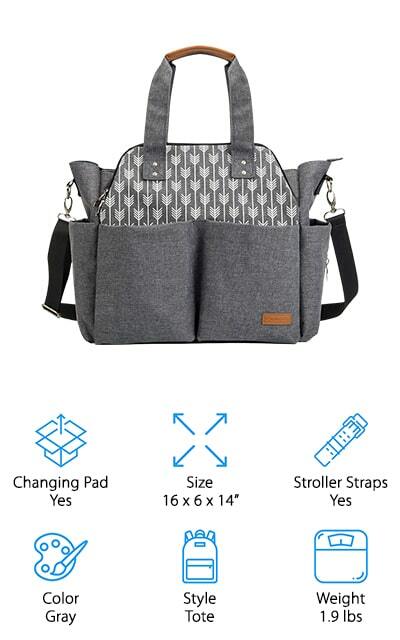 If you’re looking for a big diaper bags for twins and prefer a tote style, this design from Skip Hop is worth a closer look. Not only does it include stroller straps but they’re specifically made to fit a double stroller which is obviously perfect for parents of twins. You can also use the detachable shoulder strap for a messenger bag feel or the top handles if you prefer to use as a tote. There are 16 pockets in all, including a zippered personal pocket, pen holders, and a cell phone pocket for you. The main pocket zips closed while other pockets use magnetic closures. Everything stays neat but everything is still really accessible. One more thing, the neutral polyester material is durable and easy to clean. A great oversized diaper bags for twins is the RUVALINO Large Diaper Tote. It’s a little wider than most diaper bags at 6.3-inches which means larger items fit inside pretty easily. Something cool about this one is the main compartment has a collapsible metal frame that stays put when you open it. That makes it much easier to find what you’re looking for. This bag is designed like a tote but has a removable strap so you can use it as a shoulder bag, too. The material is strong with reinforced seams at the straps and handle for extra support. The nylon outside and polyester lining are both really easy to clean, too. The stylish design doesn’t overtly look like a diaper bag, either, so this bag can easily play double duty. When it comes to cute diaper bags for twins, the ALLCAMP Diaper Bag Backpack is stylish and super functional. For one thing, it’s really versatile. You can use it as a crossbody messenger, over the shoulder tote, or a backpack. If you want to carry it as a backpack, you’ll love this: the straps have memory foam as well as textured fabric. They stay put and are really comfortable to carry. The zebra-print fabric is waterproof and easy to clean. Just toss it in the wash and let it air dry. There are a lot of different kinds of pockets, some gusseted, others zippered. You get some insulated ones, too, as well as space for your cell phone and other essentials. Not to mention a large spacious main pocket for bulkier items. 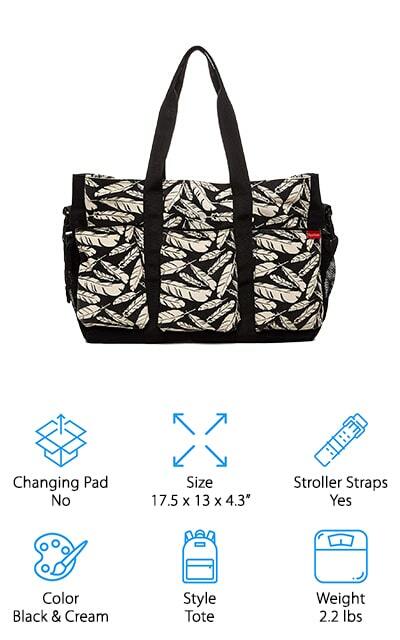 Our next pick for top diaper bags for twins comes from LNGLAT. This is one of the widest bags we found in our research at 7.7 inches. There are also separate pockets for everything from bottles to diapers for baby as well as space for your wallet, car keys, and cell phone. 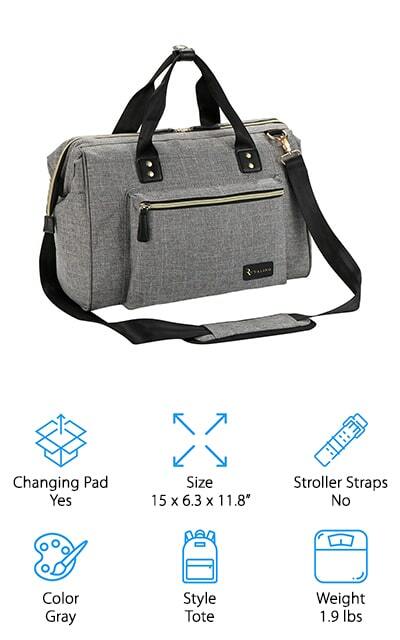 If you’re looking for a diaper bag that doesn’t really look like a diaper bag, this is a good choice. It’s fashionable and has an elegant look that would work great as a work or travel bag after your diaper bag days are behind you. The material is water resistant and easy to clean, too. That’s not all, this backpack style bag also has top handles so you can carry it like a tote if you prefer. A great extra large diaper bags for twins that we found in our research is this large bag from Lekebaby. It’s made of water repellent polyester and features a faux leather tote handle for extra durability and comfort. The gray fabric is accented with a white arrow design on the main body of the bag. It also comes with a removable shoulder strap so you can use it as a crossbody messenger-style bag, too. This one has a lot of pockets, including 9 interior and 8 exterior. There’s room for diapers, bottles, and wipes as well as your wallet, keys, and even sunglasses. Stroller clips are included which are compatible with most strollers. You also get a padded changing pad for easy on-the-go diaper changes when there’s no changing table to be found. 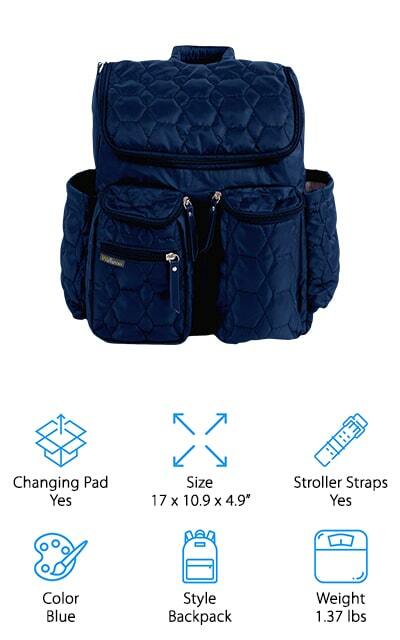 A great choice for diaper bags for boy and girl twins is the HapTim Large Capacity Diaper Bag. What’s so unique about this one is it looks nothing like a typical diaper bag. In fact, it’s tall, wide design actually resembles a camping pack while the neutral gray material makes it stylish enough to carry anywhere. It has not one but two large main pockets that have plenty of room for bulkier supplies. The double deck design has a wide opening back door for easy access and a lot of different pockets and compartments so there’s a place for everything, including your tablet, cell phone, wallet, and keys. 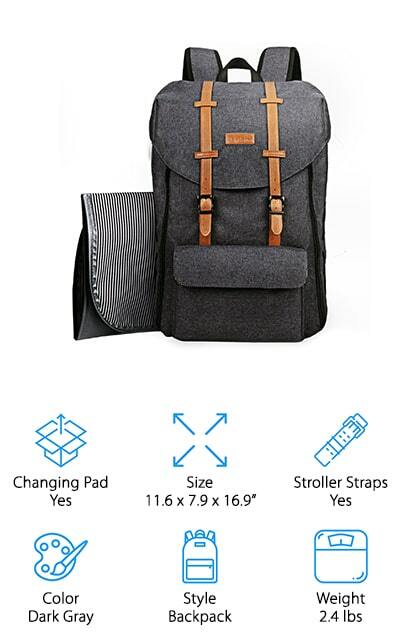 This backpack design features comfortable straps and an ergonomic design so that carrying this large pack is no problem. There’s a reason this brand is called Bliss Bag and this diaper bag is a perfect example. The waterproof nylon material is the perfect choice because it’s easy to clean and very practical while still looking very stylish. Inside, it has a polyester lining is easy to wipe clean. There are an insane amount of pockets, 20 in all. They include a large insulated bottle pocket, 2 long side pockets, 3 insulated bottle pockets, and a magnetic wipe pocket for easy access. The backpack design features adjustable padded straps as well as a padded back support panel that make it comfortable to carry. And here’s the kicker, it comes with a 1-year warranty. If anything breaks, you can simply exchange it for a new one. Last but not least is this HC Diaper Bag for Twins. It’s a really stylish bag that features both durable nylon and printed canvas with a black and cream feather print pattern. It would actually make a great work bag or weekender bag, too. 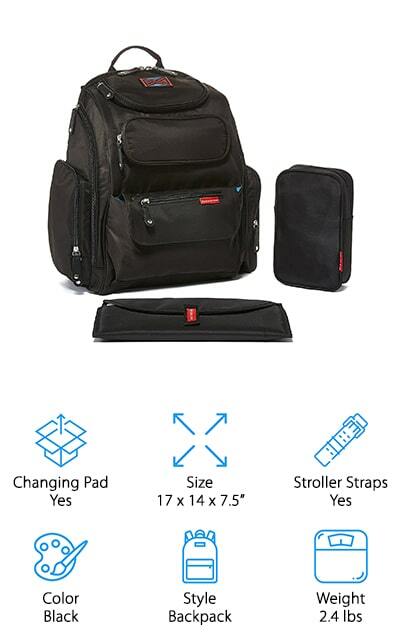 There are 7 internal and 7 external pockets, including a personal pocket with a strong zipper, side pockets for bottles and sippy cups, and 3 large deep front pockets with magnetic closures for anything else you need to bring along. There’s room for your personal belongings, too, including pen holders and an easy access cell phone pocket. This tote bag comes with an optional shoulder strap for a bit of versatility. Stroller clips are also included and it was made to attach to a double stroller.